Unlocking Your Disabled iPad Is hard? Use These Easy Tips! Why is Your iPad Disabled? How to unlock disabled iPad cannot be fully discoursed if we don’t point out factors that can make iOS security features disabled your device. 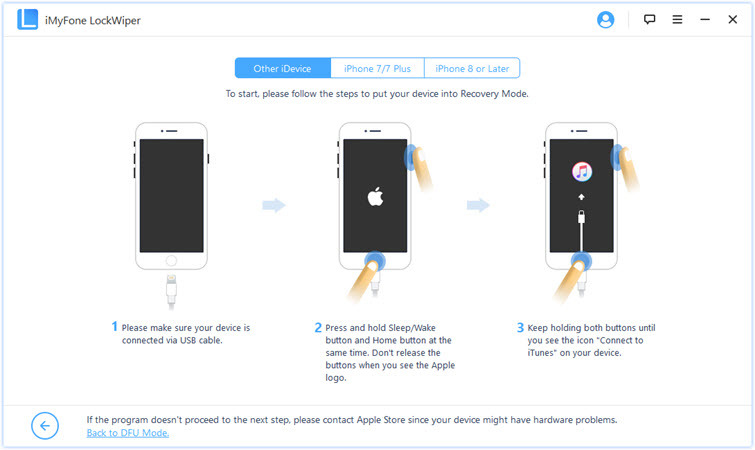 Here are some of the reason why your iPhone may be disabled. If your iPad is stolen and someone tries to hack into it by inputting the wrong passcode repeatedly, your iPad will be disabled. If you forgot the passcode to your iPad, your device will be disabled after inputting the wrong passcode several times. If your child tries to enter the wrong passcode why trying to unlock your iPad, then it will be disabled after 6 consecutive trials. Some iPhone users expose that iPad is disabled after update. Some are even stranger, iPad is disabled for no reason. 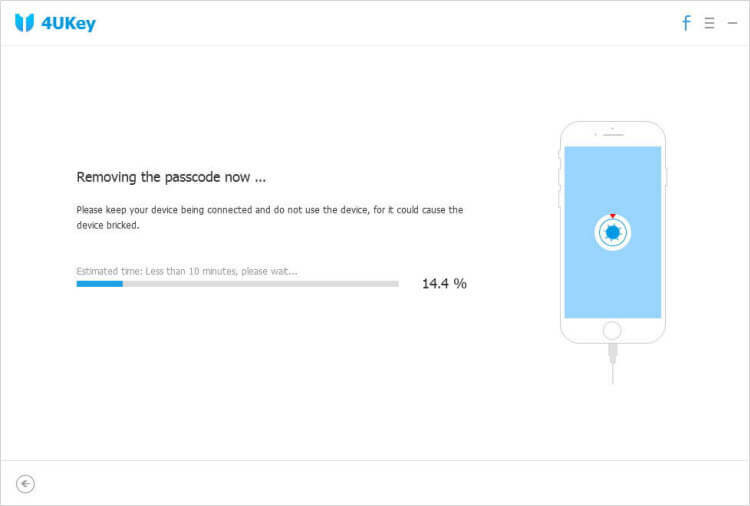 Nevertheless, the easiest and the safest way to unlock a disabled iPhone is by using an iPhone unlocker tool. Therefore, if you seeing any of the following messages: “iPhone is disabled. Try again in 1 minute”, “iPhone is disabled. Try again in 60 minutes” and “iPhone is disabled. Connect to iTunes”. Then you can choose a software below to open your iPad in a few seconds. If you want the easiest and safest way to unlock a disabled iPad, then we are glad to introduce you to the following iPhone unlocking software: iMyFone LockWiper and Tenorshare 4uKey. iMyFone LockWiper is the right, best, easiest, fastest, and the safest tool for unlocking a disabled iPhone or iPad in mere minutes. It can be operated on a Windows and macOS operating systems. It promises to get you into a disabled iOS device without password and grants to remove the password if you forget it. When it’s done, you can set up a new password without entering the old password. 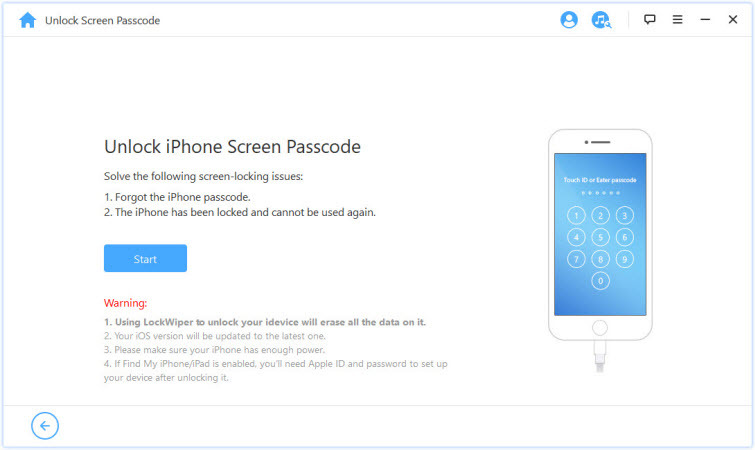 One of the key functions of LockWiper is that it can remove the iPhone screen lock and Apple ID without a passcode. It can also unlock 4-digit and 6-digit passcode, Face ID and Touch ID locked iPads. If your iPad is screen broken or has a faulty button, don’t worry; LockWiper can help you unlock your iPad. Unlocks disabled iPad even in a critical situation such as iPads with broken screen, second-hand iPads, and iPads with faulty buttons. Remove the previous iCloud account to enjoy a new one. Removes 4 different types of iPhone screen lock such as 4-digit and 6-digit passcode, Face ID and Touch ID. It’s a complete do-it-yourself software without expert skills required. Grants 99.99% success rate and 100% security. 5.Also helps reset your iPhone or iPad without Apple ID or password. iMyFone LockWiper is fully compatible with all iPhone, iPad and iPod touch. LockWiper has won iPad users heart, and it’s trusted and recommended by top tech media websites, including SOFTPEDIA, download.hr, iOS HACKER, etc. Step 1. 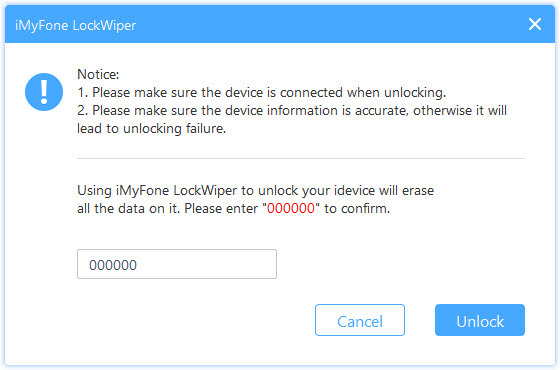 Launch iMyFone LockWiper on your PC, and click “Start” to begin the passcode wiping process. Step 2. Connect your iPad to your PC. choose your device model under “Other iDevices” on the top bar, and put your iPhone/iPad in DFU mode. Step 3. Check if the auto-detected device is the same as your device model. 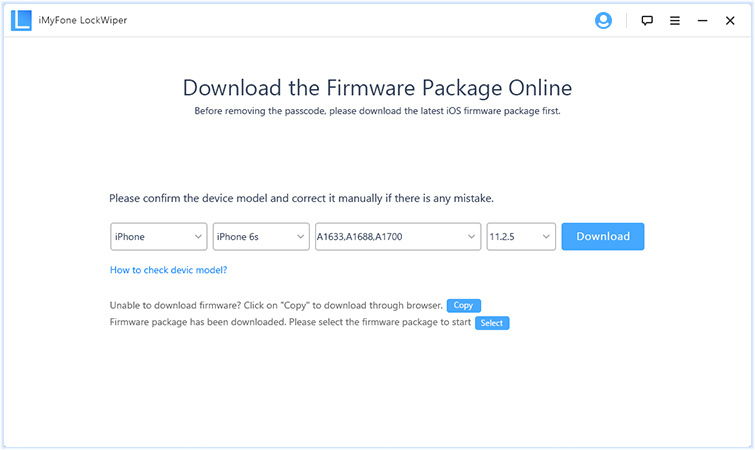 Click “Download” to download the firmware package. Step 4. When it’s done, tap “Start to Verify”. Step 5. When verification is done, click “Start Unlock” to begin the unlocking process. Enter “000000” into the box and click “Unlock” to confirm that you’re unlocking your device. If you are still looking for more options on how to unlock a disabled iPad, then consider using Tenorshare 4uKey. 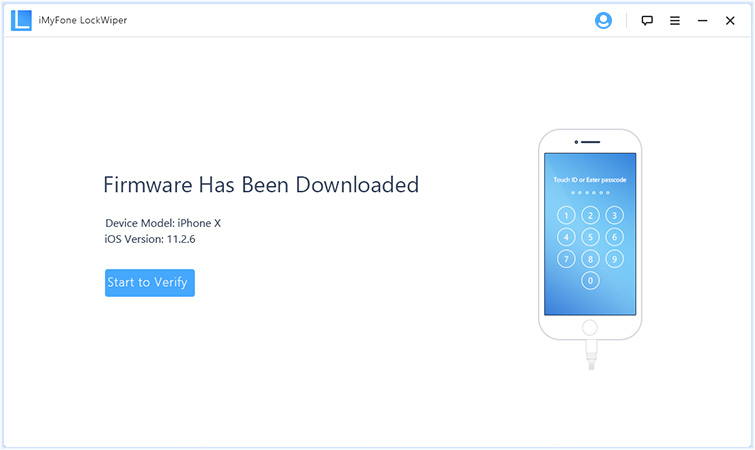 This software is an iOS unlocker tool that can help you to unlock your new or old iPad, iPad Pro, iPad Air, etc. Even if you set the hardest passcode or your child/friend sets a passcode on your iPad, this tool will erase this passcode and give you access to your iPad again. 4uKey is also capable of removing 4-digit and 6-digit passcode, Face ID and Touch ID on iPads. Tenorshare 4uKey can unlock easily unlock an iPhone or iPad without a passcode. 4uKey has proven to be successful in unlocking different types of iPad lock such as 4-digit, 6-digits, Face ID, or Touch ID.